[PDF] The Chemistry of Organic Derivatives of Gold and Silver | Free eBooks Download - EBOOKEE! 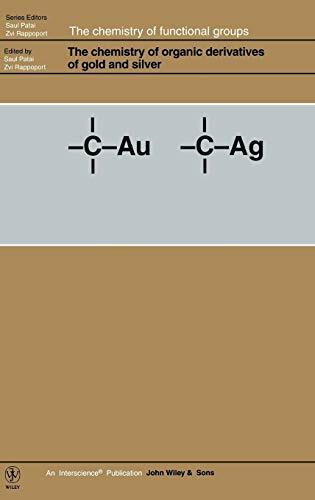 Description: The 100th volume in this highly successful and renowned Patai and Rappoport series 'The Chemistry of Functional Groups' is fittingly devoted to the precious metals, gold and silver. Gold is a soft metal occurring naturally as particles in quartz or as nuggets. Gold was initially used extensively in coinage and jewellery and has recently found applications in biochemistry, medicine and material science. Gold readily forms organometallic compounds (R-Au-L with L = sulphide, phosphine and isocyanide), oxides and halides. Silver is a ductile metal which was used in coinage and for mirrors. It is now used for jewellery, electrical conductors, dental and surgical components. Silver forms stable silver halides for use in Photography and i.r. spectroscopy as a support material. Other silver compounds are also used in catalysis. This volume contains 16 chapters dealing with calculations on organogold compounds, physical and spectroscopic properties (NMR, ESR, PES, Mossbauer spectra), thermochemical and analytical properties, the synthesis and uses of the title compounds and their reactions such as rearrangements, pyrolysis and photochemical reactions. The medicinal use of organogold compounds and the increased use of gold-thiol monolayers are also summarized. Each of the chapters has been prepared by leading scientists in this field making this volume invaluable for researchers in academia and industry working with gold and silver, in biochemistry, pharmaceutical and materials chemistry. Organic compunds containg Nitrogen are of outstanding importnce in biochemistry and in environmental systems. This volume gives a sound introduction into physical chemistry of amino, nitriso, nitro and related functional groups. This volume is now available in electronic format from Books Online. No comments for "[PDF] The Chemistry of Organic Derivatives of Gold and Silver".